Frill-necked lizards are amazing reptiles. They are bipedal and have a beautiful frill around their neck that may remind you of a prehistoric Dilophosaurus. These may not be the most commonly seen pet reptile (although the original "Jurassic Park" movie made them quite popular), but they are fascinating creatures to have as pets. These lizards are good pets for both experienced and novice lizard owners, due to their calm nature and relatively simple feeding needs. They're not the longest-lived reptiles, but what they may lack in years they make up for in personality. Frill-necked lizards are docile and low-key critters, well known for running on their hind legs to escape a predator in the wild. They will expose the frill around their neck when threatened (which is how they got their name). When feeling especially threatened, they will stand up on their hind legs, frill out their neck, open their mouth and spit, exposing tiny little teeth in their mouths. If provoked, captive frill-necked lizards may nip or bite their owner's hand. 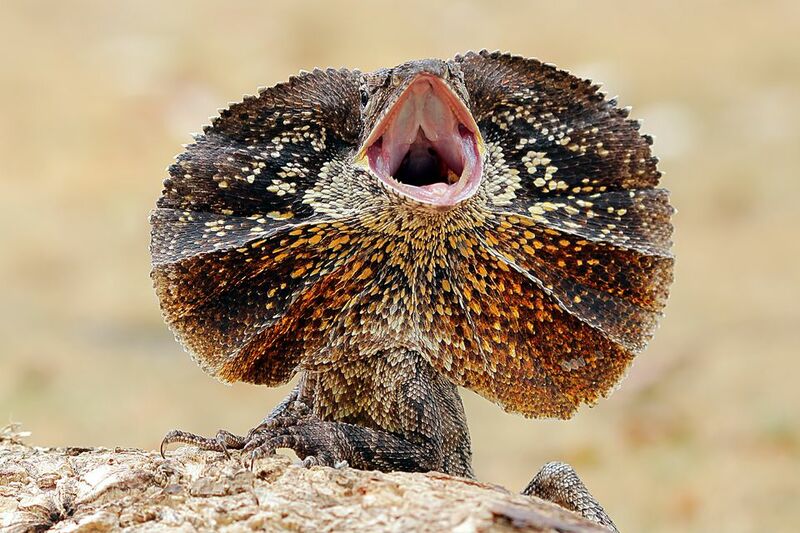 Be advised that while a frill-necked lizard with its frill fully open and on display is impressive, it generally indicates the animal is very stressed, sensing imminent danger. If your lizard is doing this in captivity, it may be a sign of a larger health issue. They don't whip their tails in defense in the wild like an iguana would (although some owners do report their pet frillies whipping their tails at them), but instead, jump at the animal and perform the aforementioned threatened routine. If breeding your frill-necked lizards, November through February are the ideal months for laying clutches of eggs. Up to 25 soft shelled eggs may be laid in a clutch and sometimes two clutches are laid in a season. The eggs must remain in soil at least five centimeters deep and kept at a minimum of 86 degrees Fahrenheit for two to three months until they are done incubating and hatch. Frill-necked lizards are originally from Australia and New Guinea where they are arboreal, meaning they spend most of their time in trees. These unique lizards cling to tree trunks and eat native insects and vertebrates. Depending on what area of Australia or New Guinea the lizard is found in, the coloration of the skin may vary to help that specific lizard fit into its environment and be better camouflaged. As pets, frill-necked lizards need an environment with 55 to 65 percent humidity and temperatures between 75 and 100 degrees Fahrenheit. A combination of heat lights and UVB lights are needed to obtain optimal temperatures and appropriate UVB exposure during the day. Frill-necked lizards usually only venture out of the trees to eat or fight but you should house them in a large tank, at least a 55 gallon, to allow them to move about when they want to. Screened enclosures allow for more climbing opportunities but do not hold in humidity as a glass tank does. As with all reptiles, you should do your best to mimic a natural environment for the best possible mental and physical health of your pet. Frill-necked lizards eat a variety of foods. Crickets and super worms are the most readily available to pet owners and should be dusted with a calcium and multi-vitamin supplement every other day. Frill-necked lizards will also eat butterworms, silkworms, dark leafy greens, sweet potatoes, carrots, split peas, and green beans. Waxworms, mealworms, mice, and fruit should be offered sparingly if you decide to give some to your lizard. Providing enrichment during feeding time is not only entertaining to watch but it is also mentally stimulating for your lizard. Try attaching an empty toilet paper roll to a branch and allow your lizard to catch some insects inside the roll. Frill necked lizards will grow to be between 70 and 90 cm long, including the tail, and males are usually larger than females. While they do come in a variety of colors, there is only one documented species of frill necked lizards. The body of the lizard is darker than the frill, which is often a yellow or orange color, but as mentioned prior, colors can vary depending on which region or country yours is originally from. There is no question that these are unique, beautiful reptiles. Frill-necked lizards were even pictured on the Australian two-cent coin until 1991 and no other animal is included in the Chlamydosaurus genus. These lizards are somewhat rare among herp owners, but there are several reputable breeders who offer frill-necked lizards. This is where you want to look if you plan to acquire one. Be sure to have an exotics veterinarian do a thorough exam, including a stool check, to ensure your frill-necked lizard doesn't have any internal parasites or other ailments. Most frill-necked lizard illnesses stem from improper care. They need exposure to ultraviolet light, appropriate heat and humidity to avoid vitamin D deficiency and respiratory infections. Signs of a respiratory infection include wheezing, breathing with the mouth open, and mucus around the nasal passages and mouth. If your lizard is not accepting food, even just once, it's usually a sign of a digestive problem such as a parasite. And if you notice your frill-necked lizard is having difficulty shedding, this may be a sign of a skin infection, usually fungal in nature. Ideally, you'll establish a relationship with a veterinarian who specializes in lizards, so he or she can observe any changes in your pet's behavior or appearance that you might overlook. Although they are unique. there are other lizards like the frill-necked which are also interesting pets. For a complete overview of pet lizards, check out our other monitor lizard profiles here.